France held a 2-2 draw with the Ukraine as a celebration party for their qualification for Euro 2008. Les Bleus had already guaranteed their place in Austria and Switzerland with Saturday’s sequence of results. Henry and co had some new gear picked out especially for the party though. 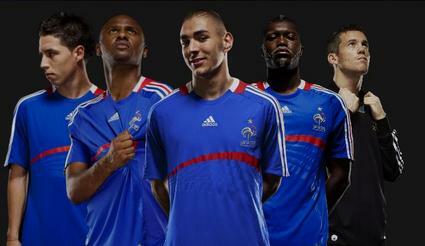 The new France home kit is pictured above. Tel has still got it, you know. Here he is with a turn and shot that wouldn’t have looked out of place in one his Arsenal purple patches.